To try me luck on Columbia’s shore, and Ned McCabe’s my name. But those good old days for laborers will never come back again. I hired out to a contractor, boys, to work upon a canawl. To secure myself a winter’s job away from frost and snow. 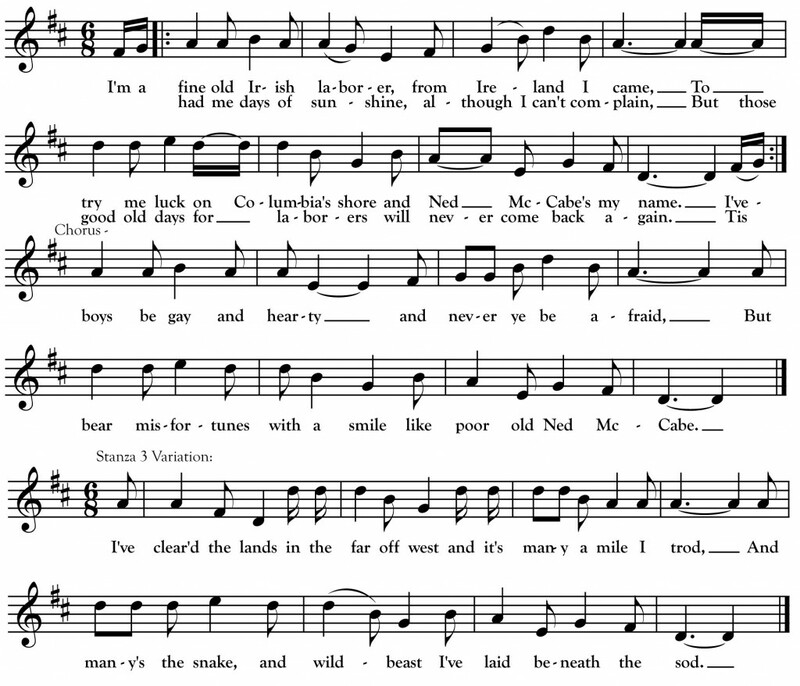 Folk song collector Franz Rickaby made the above transcription of this very rare song from the singing of George Hankins (1849-1934) of Gordon, Wisconsin in the early 1920s. Earlier in his life, Hankins worked as a lumberjack and railroad man in Minnesota before making his home in Gordon, about 45 miles southeast of Duluth. Hankins told Rickaby that he learned the song when he first came to live in Wisconsin. The song itself illustrates a familiar storyline for the first Irishmen to come to Minnesota and Wisconsin. It was common for Famine-era immigrants who sailed to Canada to find work as lumberjacks, railroad men, Great Lakes sailors or canal workers. Many of these men and their sons followed those jobs, or sometimes seasonal farm work, over the border into the US. So it was with many of the men who built Stillwater, Minnesota and other St. Croix Valley towns. And many’s the snake, and red man too, I’ve laid beneath the sod.